Bamboo, you either have it and love it, or you or your neighbor have it and you want to get rid of it. This is a very aggressive plant. Bamboo (Poaceae) is actually a giant grass. It grows most everywhere where it is warm, but some varieties will tolerate the cold. Some are small and some are very large. Bamboo travels, invading your space or attacking your neighbor’s yard or garden. You definitely want to do some planning ahead before you plant bamboo. Bamboo has large woody stems called culms. These stems are divided into sections by obvious joints. The upper nodes on these stems develop branches, and in larger bamboo these divide into secondary branches that bear leaves. They spread by underground stems called rhizomes that, like the above ground culms, are jointed and carry buds. There is clump bamboo and running bamboo. It is the rhizomes in the roots that determine which type of bamboo it is and how it will grow. Running bamboo grows rapidly and puts out runners in varying distances from the parent plant. As the runners grow and spread out they send up vertical shoots. This bamboo eventually forms large patches or groves. It grows in temperate regions and is damaged by extreme cold, but will recover. Clump bamboo just grows a short distance and then sends up shoots which form clumps that expand from the edges. This type is usually found in the tropical and subtropical areas. 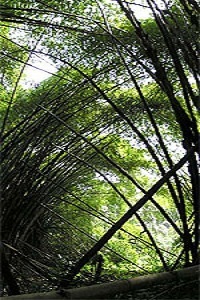 Bamboo can be planted anytime of year, especially here in The Bay of Banderas. It can be grown from complete clumps or from just the rhizomes of the roots. If you are planting from a clump, prune back some of the foliage to compensate for the root loss. The upper leaves may dry up, but it will come back from the roots. If you buy a plant from your local vivero, disregard the rule about never buying a root bound plant. The tighter the plant is in the container, the faster the growth will be in its new location. When a shoot emerges from the ground, it has attained its maximum diameter. These shoots usually attain their maximum height in a month’s time. After that they may put out more leaves but will not get any taller. They are evergreens, but many will drop a good amount of leaves year round. The individual canes will last for a number of years, but when they do die they must be cut out. Mature bamboo grows very fast during its brief growth period. Culms or canes of the larger varieties may grow several feet per day in length. This only applies to mature, well established varieties. To make them grow faster, give them a fertilizer that is high in nitrogen. To curtail there growth, feed less and cut back on the water. Both running and clump bamboos grow well when roots are confined. Many do well as potted plants. They will require frequent dividing and trimming and lots of water to keep them happy. 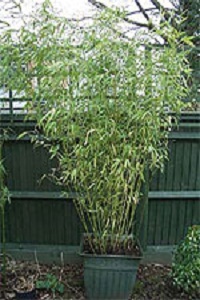 To keep running bamboo from running amok in the garden, you must confine them with 2 to 3 foot sections of galvanized metal around the root system. You can also use heavy plastic, cement or oil drums with the bottoms cut out. Another way to control running bamboo is to dig a foot deep trench around the plant and periodically use a sharp spade to cut off the rhizomes around the edges. Take care where you put these rhizomes and don’t drop any as they will sprout and start a new plant. There are hundreds of varieties of bamboo available. Many are small plants growing only one or two feet in height. These are the dwarfs. The giants will top off at 40 to 50 feet. These are called timber bamboo and are used for building in many parts of the world. The foliage can be light or dark green, solid or variegated. Leaves may be fine or coarse. Bamboo is not good as a year-round indoor plant. It can be used indoors in bright rooms with ventilation, but when it starts to look bad, send it back outside to recover. Feed the plant well and give lots of water. Make sure it has good drainage. Do not move it from inside out into direct sunlight or it will burn. Bamboo has a few enemies, but not many – mostly mealy bug and scale. These seldom do much damage, but if they persist and are bothersome, a detergent and water works well, or use a commercial insecticide. Certain varieties of bamboo will bloom at intervals. Many bloom often, and some only every 20 or 30 years. Some bloom each year and some bloom and then die. This is a very well rounded plant. The blooms are “tassellike” as are other grasses. Bamboo is the only plant I know of that gets as much or more attention about getting rid of it as about growing it. It is so invasive and drops so many leaves that it causes lots of problems and messes. This is especially exasperating when it belongs to your neighbor but drops its leaves and sends out runners on your side of the fence. 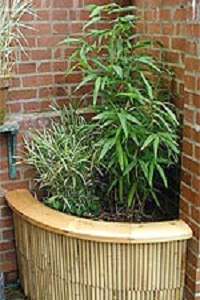 There are several ways to eliminate unwanted bamboo. Digging it out with a spade is the surest way but also the hardest. Be sure to get every rhizome or you will have re-growth. You can starve off the roots by cutting all canes off before they reach 2 feet in height. This is ongoing and must be repeated as it sends up new shoots. Since bamboo is a giant grass, it can be controlled by an herbicide or weed killer (Roundup). This must be applied to the leaves of the plant. Pouring it on the roots will not work. It is systemic and will be absorbed into the plant and kill it down to the roots. Spray any new growth that might come up. This is not an overnight thing; it may take several weeks to take effect. Compared to the spade this is lifesaver (or ender). 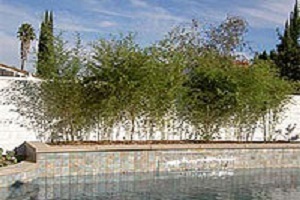 There are many places in the home and garden where nothing can compare to bamboo. But there are just as many places where it should not be. Think ahead before you plant it. If you are not sure, confine it to a pot or other restraint to keep it under control. Bamboo can be just like your neighbor’s kids or dogs, nice to look at, but keep them out of my yard unless well controlled. Keep your plants up… till next time.